Some North American doll collectors will recognize her. Other won't. To those who don't know her, Jenny was originally a Barbie doll designed for the Japanese market. The Mattel Barbie we all know and adore was simply not cutting it with those Japanese kids. I guess she was too hot for them. So, Mattel struck a deal with a Japanese toy company named Takara in 1982. She was altered to suit Japanese preferences, with her big [anime] eyes, small lips and less mature physical structure. Takara Barbie was born. In 1986, however, Takara's licensing agreement with Mattel expired. Dunno what happened there. Because Takara owned the rights to the doll's design they kept her as is but with a new name, Jenny. Voila, Takara Jenny was born! While she is a popular fashion doll in Japan, she's not quite as popular as Licca-chan...But, that's another story. When I was around 10 or 11 years old I received a doll for Christmas named Gimby. I remember her with long blonde hair with bangs and she was wearing a nice red ball gown. Her face looked exactly like Jenny's which leads me to believe that she was a Jenny doll knock-off. 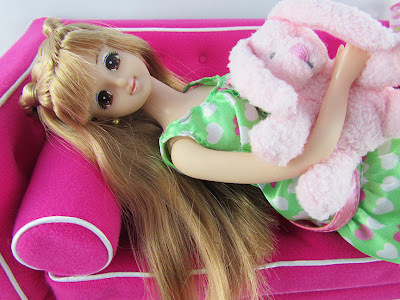 Because Gimby looked like Jenny, I feel a wave of nostalgia whenever I do look at my Jenny doll. Why, oh, why didn't I drag my childhood dolls to Canada with me! My Jenny [and you will notice that the first of any type of doll I own gets to keep their original name...] was bought off of Ebay. I got her for a steal a few years ago, actually! Her box was not in a pristine condition but she was, nevertheless, in a never-removed-from-box state so I was happy. She originally had a school uniform on...but Francie's stolen that attire a while back. She's got bendable arms and legs...not the 'bendable-click' that Mattel Barbie has, which can only bend with a few clicks, more like a rubbery bendable...if that makes any sense. Jenny also reminds me of Sailor Moon, an absolute favorite anime during my teens. It must be her anime eyes! I would love to have her in a sailor suit but I can't sew for the life of me! Thanks for the background info. It is always interesting to me to see how things transpired. I don't normally like the anime eyes, but Takara Jenny is nice. The anime eyes are not for everyone but when they grow on you, you can get dangerously hooked! Oh that Francie looks cute in that schoolgirl outfit.